When the Samsung Galaxy S III launched, it touted many new features — from collaborative photo sharing to a pop-up video player — that we hadn't seen in a phone before. In fact, the reviewer guide from Samsung ran a whopping 48 pages, versus the usually 1-2 pager. Figuring out which of those many functions would actually prove useful in day-to-day use, required patience. After living with those features for a few months, here are my impressions for where the Galaxy S III really stands out from its competition, especially the HTC One X, and where Samsung still has some work to do for what we all can assume will be the next iteration, the Galaxy S lV. Note: While network features and color options will be slightly different, the Galaxy S III on all five carriers — AT&T, Sprint, T-Mobile, U.S. Cellular and Verizon — is essentially identical. Most of my review was conducted with the 16GB T-Mobile version. 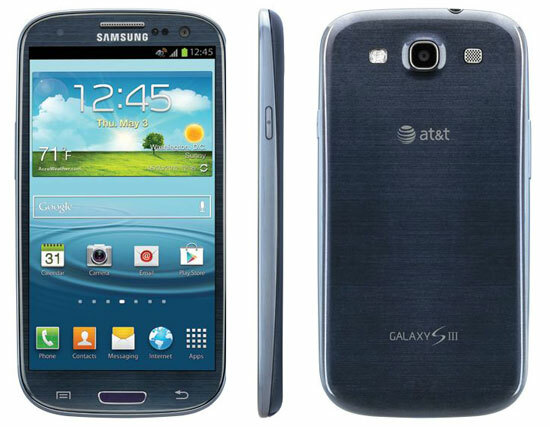 The Galaxy S III is very similar in size to the One X — that is, it's a big phone (5.38" x 2.78" x 0.34"). That said, the Galaxy S III is not an uncomfortable phone to hold thanks to its slim profile, rounded sides and relatively light weight at only 4.7 ounces (though my wife, with smaller hands, had a different perspective). It also fits well into a pants pocket and, because the power button is on the side rather than the top (as in the One X), didn't have a tendency to turn itself off when I sat down. The case on the Galaxy S III hasn't evolved much since the original Galaxy was launched in 2010; it's still a cheap feeling, slick plastic which stands in stark contrast to the solid polycarbonate case on the One X or the all aluminum design of the iPhone 5. Buttons on the Galaxy S III are well-placed, with the power button on the right side for easy thumb access and a volume rocker on the left, and raised slightly to activate by feel.. The Galaxy S III has a 4.8-inch HD Super AMOLED display (1280x720) that's just a hair larger than the One X's 4.7 inches. That gives you plenty of real estate for browsing the web, watching movies or reading your email with slightly larger text (for those of us in the over-40 crowd). Generally speaking, the quality of the display is excellent. Like other Samsung AMOLED devices, the Galaxy S III offers rich colors, terrific contrast and crisp fonts. But the display is also noticeably dimmer than other phones, and that becomes quite apparent when it get washed out in bright light, especially sunlight. Users may find themselves manually setting the brightness to maximum, which won't do well for battery life. Covering the display is Corning's new Gorilla Glass 2, which is advertised as thinner and lighter than the previous version, with the same scratch and break resistance. Unfortunately, I was reminded the hard way that break resistant does not mean break proof, as a short drop onto the sidewalk from my pants pocket shattered the screen into a spiderweb of cracks. Though I've dropped many phones in my testing, this was actually the first one I've ever broken. I suspect that the ultra-thin plastic bezel around the screen may provide less protection than thicker bezels or bezels made from stronger materials, like the aluminum case on the iPhone 5. Call quality on the Galaxy S III is excellent and the speakerphone offers plenty of volume. The Galaxy S III runs on each carrier's LTE network (except on T-Mobile, where it is HSPA+ 42). My primary test unit was on T-Mobile and I saw a wide variance in speeds, from around 4Mbps all the way into the low 20Mbps—about what I expected on T-Mobile. The GS III has a 1.5GHz 2dual core processor that makes fast work of web browsing. If there is one area where the Galaxy S III takes a great leap froward from its predecessors, it's the new 8MP rear-facing camera. The new sensor takes excellent photos in optimal lighting conditions, with true colors and a very high degree of clarity. In less than optimal lighting, the Samsung starts to struggle, though much less so than most other phones; colors become muted and motion blur begins to creep in, though noise is still restrained. Between the HTC One X and the GS III, I found the HTC provides better exposure and detail in low light, though the GS III does a better job at maintaining color accuracy. Samsung's HDR mode is also there to help out with tricky lighting, but did not equal the HTC One. The 1080p video quality was also excellent, though I missed the slow motion capture available on the HTC One line and other phones, such as the Motorola Atrix HD. To support the excellent quality, Samsung has added a cornucopia of camera features—some useful, some less so. Among the most useful are the ability to take still captures while shooting video (a feature also found on the HTC One line and iPhone 5). Also helpful is the burst shot/best shot mode, which shoots up to 20 photos at a rate of three photos per second, then lets you pick the best photo, while automatically deleting the rest. For those socially inclined, the Buddy Share feature uses facial recognition to tag your photos with names from your contact list and then offers up a number of instant share options. Less useful, but still interesting, is Share Shot. The idea is that you and a group of friends can link your Galaxy S III phones together at an event (e.g., a wedding or graduation) and then automatically share the photos each of you takes with the rest of the group. While it sounds great in theory, it requires each participant to be using a Galaxy S III and to connect their devices together at the beginning of the event. The Galaxy S III currently runs Android 4.0.4 Ice Cream Sandwich and will likely be upgraded to 4.1 Jelly Bean soon. But in addition to the standard Android features, Samsung throws in a bunch of additional features—again, some useful, some less so. The feature I appreciated most is also one of the least intrusive—Smart Stay. The concept is simple, the Galaxy S III uses its front-facing camera to determine if you are looking at the screen. If you are, the display won't dim or lock. It's hard to appreciate just how useful this is until you move back to another device and realize how often you are hitting the display to keep your phone from locking or unlocking the phone to reawaken it while you're in the midst of reading a web page or checking up on email. Simple, yet brilliant. The feature with the least value (I would even argue negative value) is the one most touted by Samsung in its initial marketing—S Voice. Intended to be Samsung's answer to Apple's Siri, offering voice commands for everything from setting calendar appointments to searching the web. Unfortunately, S Voice is almost completely tone deaf, rarely interpreting requests correctly, assuming that it even acknowledges that it heard the request in the first place. And, frankly, even if S Voice did work as intended, it offers little practical functionality beyond Google's already existing (and very good) Voice Actions feature. Other features, such as the Pop Up Player that allows you to play video in a little window while you use other apps, may have some takers, but are mostly niche enhancements. The Galaxy S III was generally speedy in most general navigation functions, though it seemed to be just a touch slower than the HTC One X in moving between apps and screens. You probably wouldn't notice the difference unless you were using the two side by side but, having just come off the One X, I noticed. The Galaxy S III comes with either 16GB or 32GB of on-board memory and a microSD card slot up to 64GB. The battery life on the Samsung Galaxy S III is terrific—it easily got me through the day and into the next under normal usage. And, the Galaxy S III has a removable battery, unlike the HTC One line. The Galaxy S III is a great phone that is roughly on par with the HTC One X (AT&T), HTC One S (T-Mobile) and HTC EVO 4G LTE (Sprint) for the best phones on the market. The HTC One line has a slightly better camera, while the Samsung Galaxy S III has more sharing options. Samsung's Smart Stay feature is extremely practical, yet is counteracted by a number of unnecessary Samsung apps, such as S Voice. Ultimately, I think most buyers will make their decision on whether they prefer the design of the GS III over one of the HTC phones. However, if you're on Verizon, the Galaxy S III is definitely our pick. And then, of course, there's the iPhone 5. My feeling is that the momentum has shifted and now it's Apple's turn to play catch-up. Yes the screen has grown to 4 inches, but that's still quite a bit smaller than its Android rivals—helpful for holding in the hand, but not nearly as friendly for browsing the web, reading emails or just about anything else. And the two areas where iPhone had the clear lead a year ago—it's camera and app selection—have become a toss up. And the Android operating system itself has improved dramatically, offering a number of features Apple's iOS does not. In any case, the Galaxy S III is a terrific phone. And with Samsung predicting they will sell 30 million Galaxy S III phones before the end of this year, there are plenty who agree. But How Does it REALLY Compare? Good long-term review. It was unclear to me if you had any significant (a few weeks or more) usage of the HTC One X to really compare it too? Based on reviews, it seems the One X has the better display, especially in outdoor light, and the better UI, HTC Sense besting the Samsung offering. I’m still on an iPhone as I needed more than 16GB and am on AT&T. HTC One X+ to the rescue. It will represent my first defection from iOS. I will probably miss some aspects of the iOS world but I won’t miss having to wait for jailbreaks every time I upgrade. I used the HTC One X exclusively for a few weeks, in addition to the One S and HTC EVO 4G LTE, which are essentially the same device. My preference is for the One X because of the better display in sunlight and camera features. I think the UI is somewhat of a wash, though I would give a slight edge to Samsung for cool features like Smart Stay. After reviewing so many Android phones, I find the iPhone screen too small, and whatever advantages the iPhone had with its camera and apps have largely been erased. PhotoStream lets you share a group of photos with others, but doesn’t allow other to add photos to that stream. Uploading photos to Photostream is also a manual process. However, anyone can be invited to see your Photostream. With Share Shot, everyone who is connected (through Wi-Fi Direct) will share photos with others in the group and those photos will be shared automatically, without the user needing to go in and select them. But Share shot only works if everyone in the group has a Galaxy S III and is in relatively close proximity to each other. So, while Share Shot is very cool in concept, it’s applicability is quite limited. If there were an app (and maybe there is), that works like Share Shot, but works on any phone and stores the shared album in the cloud to share with others, like Photostream, that would be ideal. I stand corrected. Neither PhotoStream nor Share Shot or Color are the solution. got me thinking. I did some research and I think I found an app (iOS and Android OS) that combines the features of Share Shot and Photostream. Just as the author mentioned, the Gorilla Glass breaks far too easily with simple drops. I had my phone for just 2 days, it slipped out of my bag, and the screen cracked. Samsung required 2 weeks and $177 to repair it. Every person I know who has bought a Galaxy S III has cracked the screen within the first 6 months of owning it. Major product flaw!